BMX Shop & Mailorder » News » BMX Shop News » Total BMX 2019 BMX Parts - In stock! 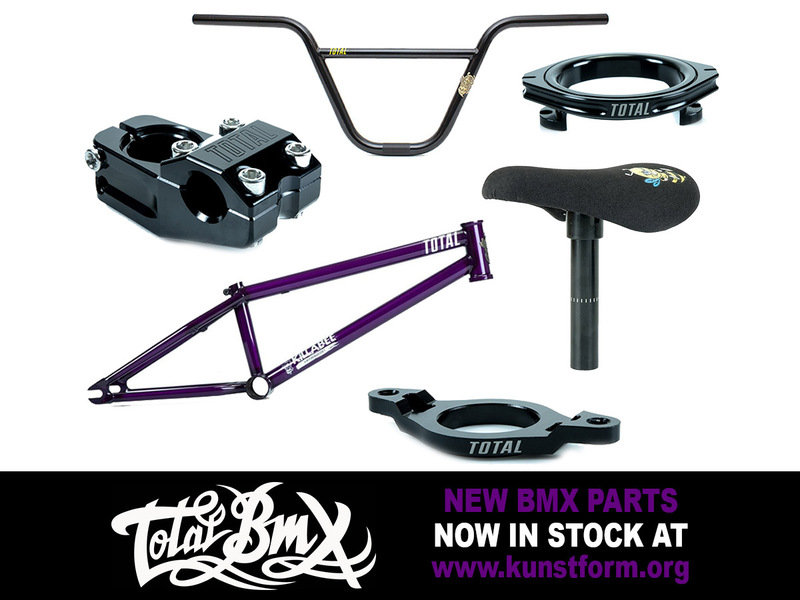 Total BMX 2019 BMX Parts - In stock! We got the new Total BMX 2019 Parts now in stock, like for example the Total BMX "Killabee K3 18" BMX Frame, which is the 18" version of the Kyle Baldock signature frame and has been created using purpose designed tubing to suit the younger and lighter rider. Also now in stock, the Total BMX "Killabee K3" BMX Bar, which is the signature BMX bar of total BMX team rider Kyle Baldock. The Total BMX "Killabee K3" BMX Bar The 2019er verions of the Total BMX "Killabee K3" BMX Bar comes with a new upsweep of 3.5° and backsweep of 10.5°. The Total BMX "Killabee K3" BMX Bar is made by heat treated multi butted 4130 CrMo and is equipped with a nice metal-killabee-badge. Check our online-shop for more new Total BMX products!